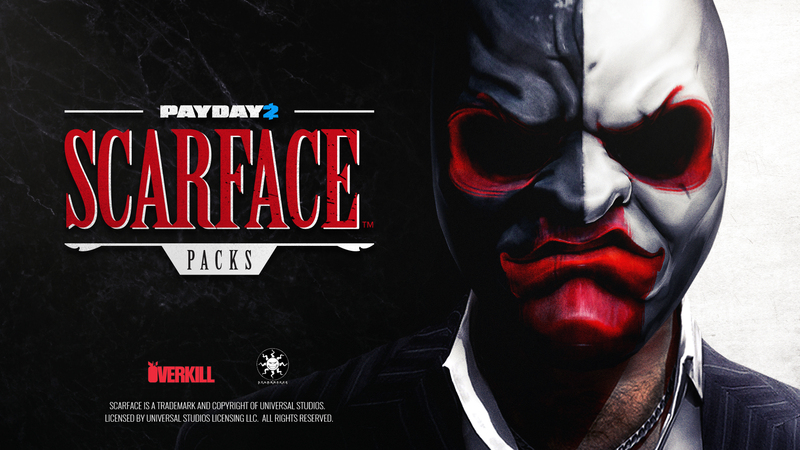 STOCKHOLM, SWEDEN (December 14, 2016) Starbreeze AB, an independent creator publisher and distributor of high quality entertainment products, today announced its collaboration with NBCUniversal Brand Development to bring the cult classic Scarface™ to PAYDAY 2™. The Scarface™ Heist Pack and Scarface™ Character Pack will be released on the digital distribution PC platform Steam on December 15. The Scarface Heist Pack will be priced at $6.99 and contain the Scarface Mansion Heist with additional content. The Scarface Character Pack will be priced at $4.99 and will let you play as the legendary Tony Montana himself together with appropriate themed weapons and Perk Deck. First launched in 2011, PAYDAY is a hugely successful cooperative first-person shooter computer and video game franchise with more than 14 million players on PC, SteamOS, PlayStation 3, Xbox 360, Playstation 4 and Xbox One. Starbreeze has set out to develop truly immersive virtual reality experiences, by integrating software and hardware in its StarVR head mounted display, to be produced together with Acer, displaying a unique field of vision and a mission to bring top-end VR to large audiences. Starbreeze launched StarVR with a VR-experience at the Electronic Entertainment Expo (E3) in June 2015, gained by teaming up with French Infinite Eye. In January 2016, Starbreeze unveiled the StarCade initiative; centers that invites people to immerse themselves into premium VR experiences. The first cinematic VR experience “Cockatoo Spritz” directed by Stephane Barbato, premiered at the 69th Cannes Film Festival 2016. NBCUniversal Brand Development globally drives expansion of the company’s intellectual properties, franchises, characters and stories through innovative physical and digital products, content, and consumer experiences. Along with franchise brand management, NBCUniversal Brand Development’s core businesses include Consumer Products, Games and Digital Platforms, and Live Entertainment based on the company’s extensive portfolio of intellectual properties created by Universal Pictures, Illumination Entertainment, DreamWorks Animation, and NBCUniversal cable and television. NBCUniversal Brand Development is a business segment of Universal Filmed Entertainment Group, and part of NBCUniversal, a subsidiary of Comcast Corporation.